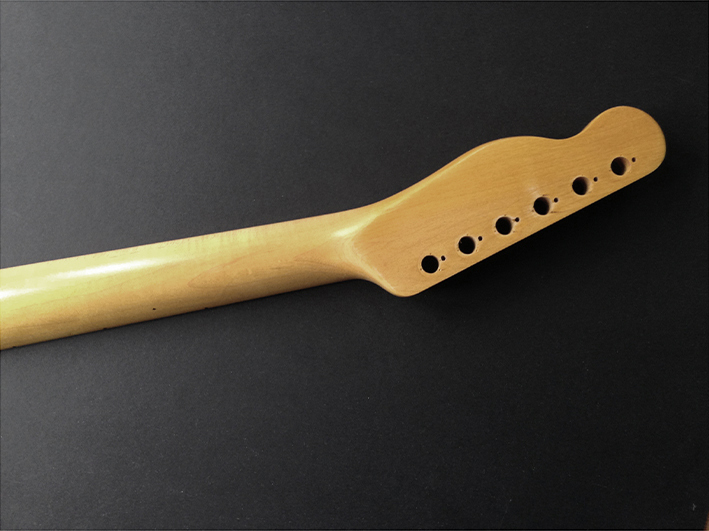 The neck we are using for this build is taken from a modern Tele and therefore has the usual polyurethane finish which is applied to new guitars these days. However, for our build we are going to need a vintage amber nitrocellulose lacquered finish in order for the neck to look the part. The neck that we are using on this guitar was rubbed down in an early stage of this build (see Parts used for this build) and is ready for its first coats of lacquer. To replicate the look of Francis’ guitar we need an initial application of a warm vintage amber nitro lacquer. There is no other way to get the right look other than to use nitro as it has a unique look and feel and will yellow and crack with age, all of which will add to that vintage Tele feel as the guitar continues to age with time and use. As you can see from the two pics above, we have applied several coats of amber nitrocellulose lacquer to the neck. When these coats of lacquer harden we will apply Roots Replicas decals and then finish with a clear nitro top coat to seal everything. 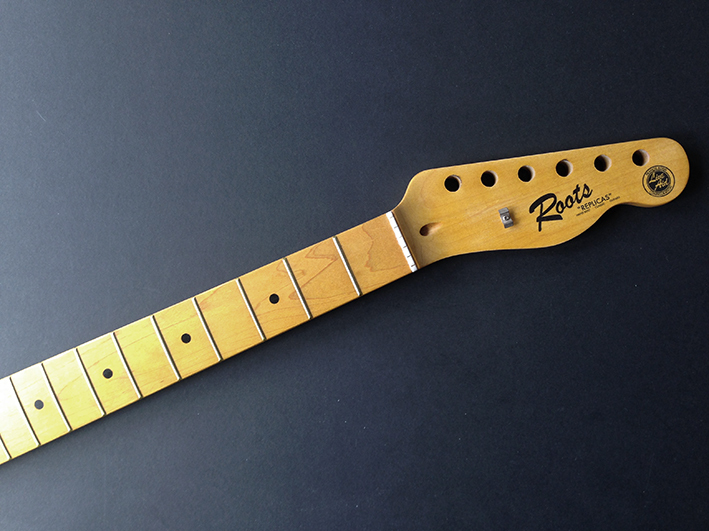 When the finished neck is fully hardened we will relic it by replicating all of the wear marks present on the fretboard at the 1985–86 period. It’s important to note that at various stages Francis has had the fretboard refinished and so the wear marks have come and gone over the years. However, I believe that the wear marks from our time period (see below) predate any refinishing and are original. The clip below is a performance of Down Down taken from Top Of The Pops back in 1975 and provides some good views of the neck for reference. Work on the neck is progressing nicely and as you can see from the pics below, the amber colour is now slightly darker with the addition of more lacquer coats. 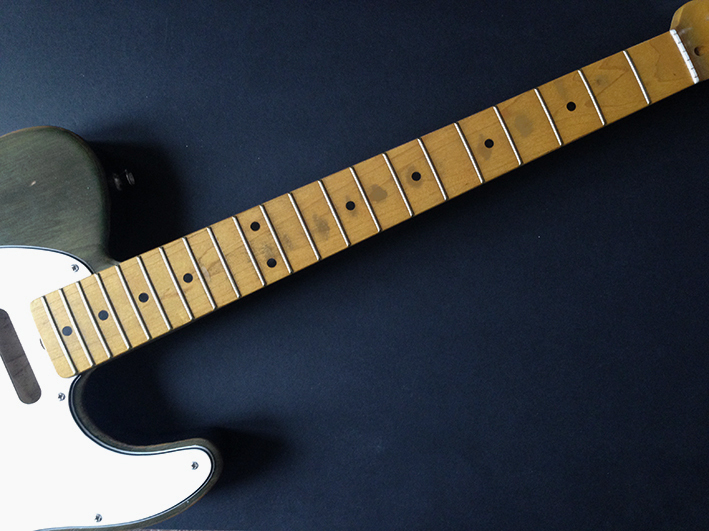 We have now added the decals but we still need to add a few coats of clear nitrocellulose over the next week or so. When this is done we can start adding the hardware to the neck prior to fitting to the body of the guitar. 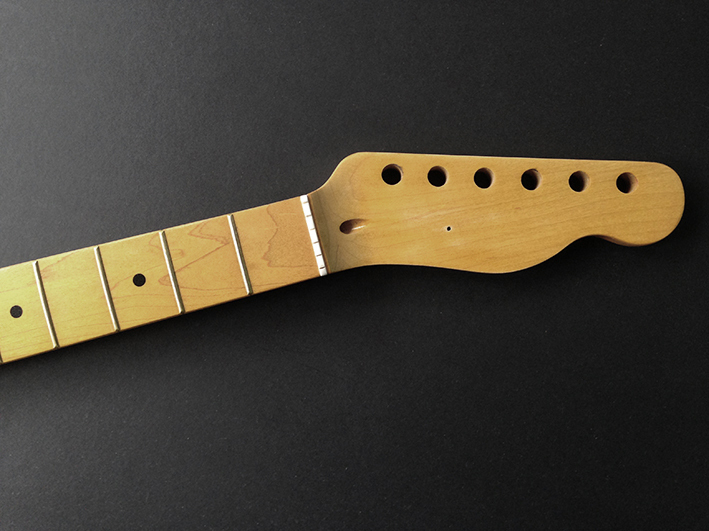 When the neck is eventually finished and hardened up we will be able to start adding hardware. 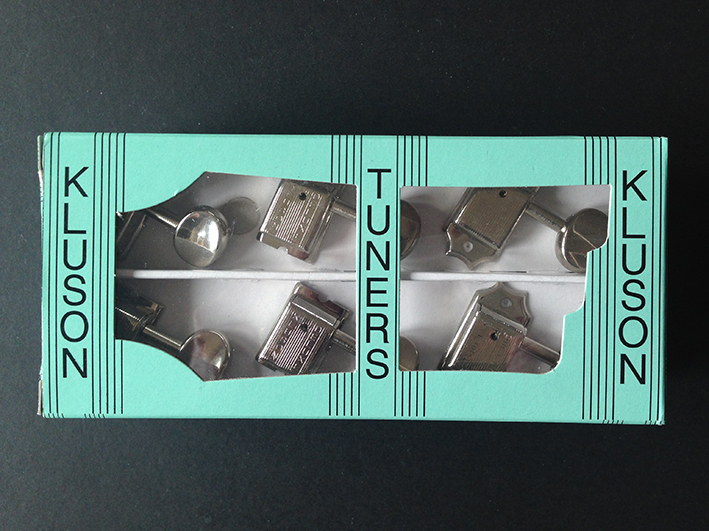 The most important element of which are the 6 in-line tuners. We can’t even consider using modern Fender-style chrome-plated chunky tuners on this build as they will compromise the entire look of the finished guitar. Instead, we will be fitting brand new genuine Klusons which are identical to the ones used on Francis (and Rick’s) Teles originally. Quite often, Rossi replicas are fitted with lookalike tuners, which are pretty good in the main but are not quite right. In fact there are even some genuine Klusons out there which are not quite right either. 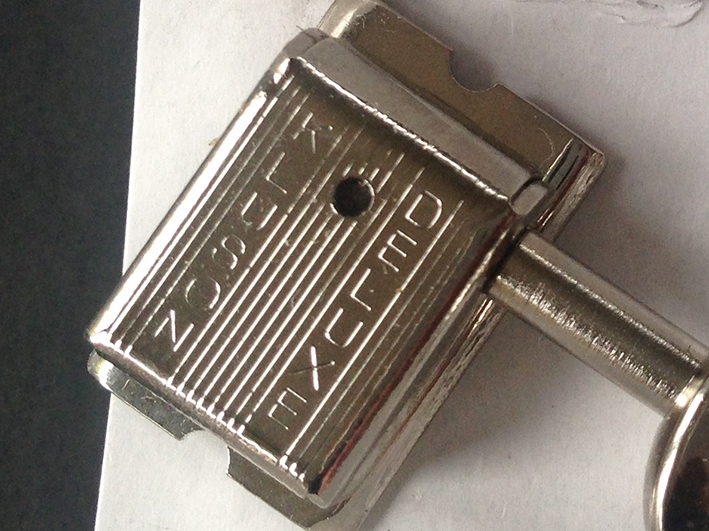 In order to be authentic the casing on the back of each tuner unit should be stamped with Kluson Deluxe (as below), all in capital letters and set out in two vertical lines of text with the distinctive lined pattern in between. Most Kluson copies have no wording on the backs and/or just the lined pattern and one or two genuine Klusons don’t have the wording set out exactly as above. There are of course plenty of excellent quality copies out there too, but the tuners that we are using are the same as the ones on the OG. The genuine Klusons we are using are also nickel-plated. This is important because they need to have that correct nickel colour to look right. Some lookalike tuners are chrome-plated and whilst they do a perfectly good job as tuners they do not have that vintage nickel colour which we need here and which adds so much authenticity to a rebuild such as this. Francis and Rick both kept the same sets of original tuners on their guitars for years, but these days they get changed once per year on average, so I believe. The neck is finally finished and has been slightly buffed up, although the finish is not really ‘shiny and new’, it’s more ‘vintage’ and ‘well used’ with a few dings here and there. 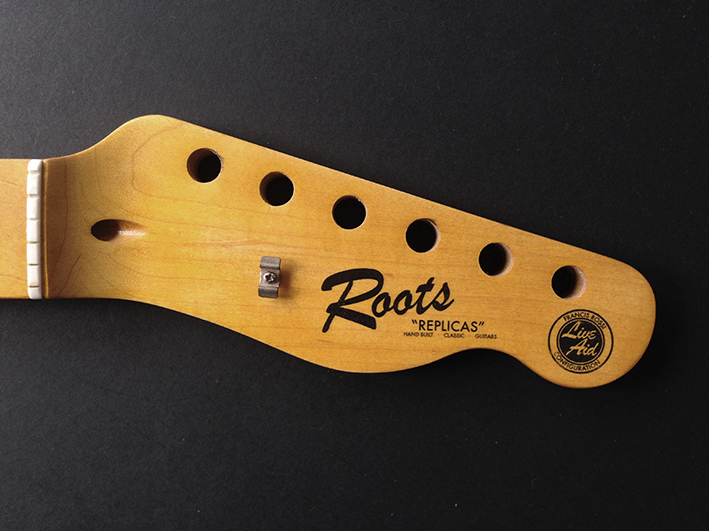 As you can see from the first two pics below, we have now added those classic Kluson tuners to the headstock. The Klusons really complete the classic period look, and are well worth the extra expense in my view. You’ll see from the first pic below that the neck on Francis’ guitar does not feature the inlayed dark wood ‘skunk stripe’ inlay which covers the truss rod on modern Tele necks. 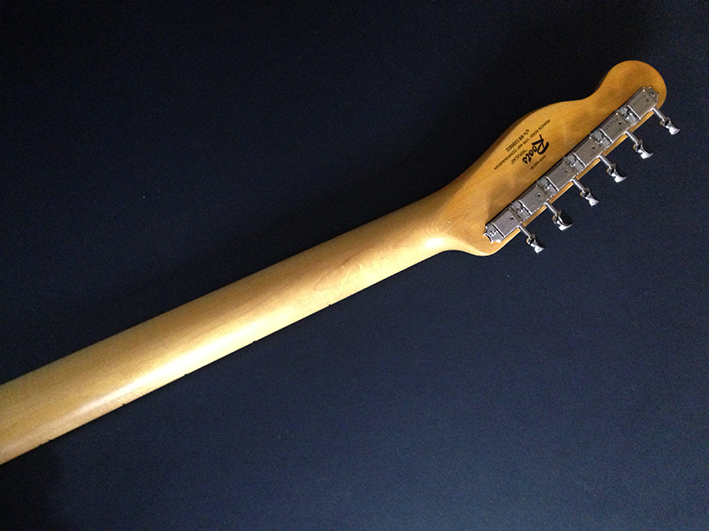 As already covered (see Parts used for this build) on this blog, Francis’ guitar has a 2-piece maple neck (correct term is maple board neck as the fretboard glued to the maple neck can also be made of dark rosewood) with the truss rod inserted prior to fretboard fitting, resulting in no ‘stripe’. Our neck (second pic) is a much more economical 1-piece copy but with the bonus of not having the stripe (as the truss rod channel has been drilled out). The adjustment for the truss rod is at the headstock instead of at the heel, but the overall look, coupled with the truss rod adjustment notch (see Pickguard) and the Klusons, is pretty close. 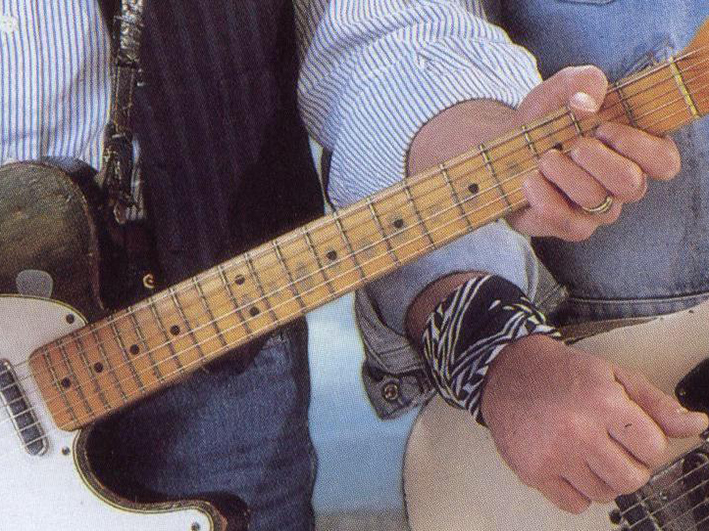 If you take a look at the two pics below you will be able to compare the various wear patches on the fretboard to the OG as seen on the cover sleeve of the Rollin’ Home single. We have replicated the wear as closely as possible using the Rollin’ Home pic as the primary reference for the period. Other references from the same era which could be referred to are the In The Army Now tour programme (section entitled The Armoury) and of course, pics and footage from Live Aid. If you look closely at the two pics you will notice that the spacing of the two dots (11th/12th frets) is narrower on Francis’ guitar. This is something that we have not been able to replicate, but it’s a detail worth observing if you were making a neck from scratch. Now that the neck is finally finished and has had all of it’s hardware added, we will be able to join it to the body very soon. Many thanks for continuing to follow this blog. We have now joined the finished neck and body together and locked them together with a neck plate. The part we have used is a standard Fender un-numbered ‘F’ plate which has been lightly relic’ed. It is possible to buy period ‘F’ plates with their original serial numbers but they can be very expensive. 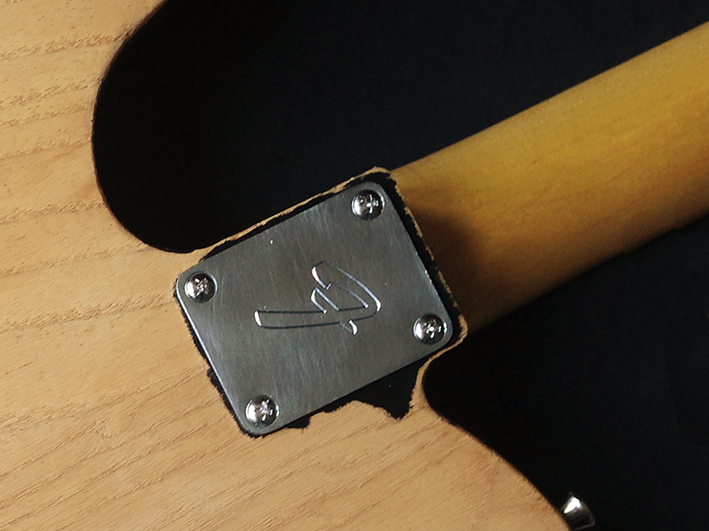 Fender serial numbering follows a standard sequential numbering system. 1950–1954 instruments are numbered 0–10,000s, 1957 ranges from 10,000s–20,000s, for 1958 the range is 20,000s–30,000s and for 1959 it’s 30,000s–40,000s. However, it’s not as straightforward as it appears. As production is unlikely to end with a round number on the 31st of December each year there is some inevitable overlap in the numbering system which means that the 20,000s range could contain both ’57 and ’58 models, the 30,000s range could contain both ’58 and ’59 models and so on. 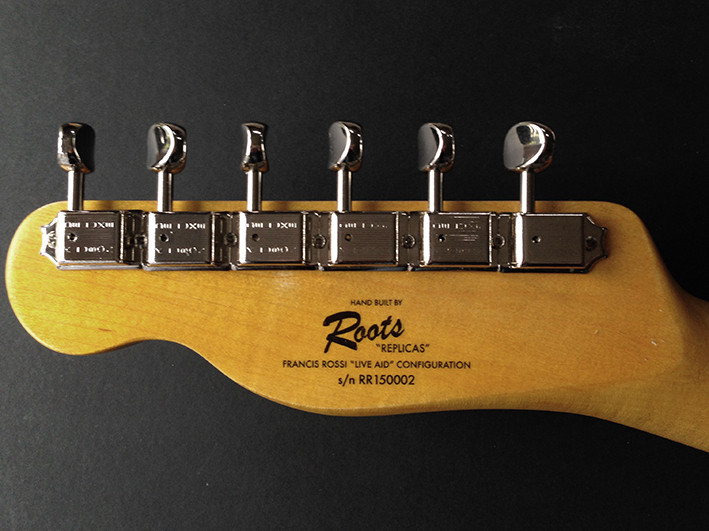 This overlapping (but sequential) numbering scheme continued as Fender were making around about 10,000 instruments in any given year during the mid to late 1950s. This carried on until 1961 when it looks like production doubled as the number range for that year was 50,000s–70,000s. Then, in 1962 the range jumped to 60,000s–90,000s. 1963 started off with a range of 80,000s–90,000s, but as production increased, they introduced an ‘L’ prefix to the system. So, the final 1963 number range was 80,000s–90,000s–L10,000s–L20,000s. 1964 was L20,000s–50,000s. The ‘L’ prefixed numbers continued into 1965, but by the end of that year Fender went into the 100,000s and dropped the prefix. 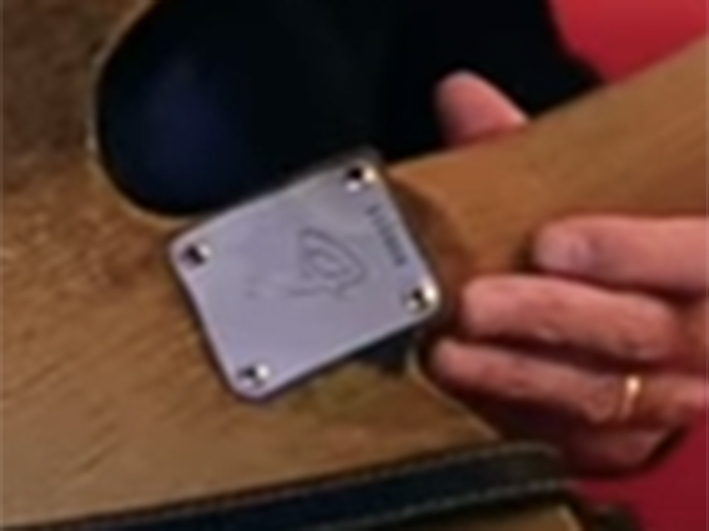 The ‘F’ plate on Francis’ guitar has the number 116959 stamped on it which raises a couple of issues with dates as the ‘F’ plate was not introduced until late 1965 and the 116,000s number dates from early 1966. 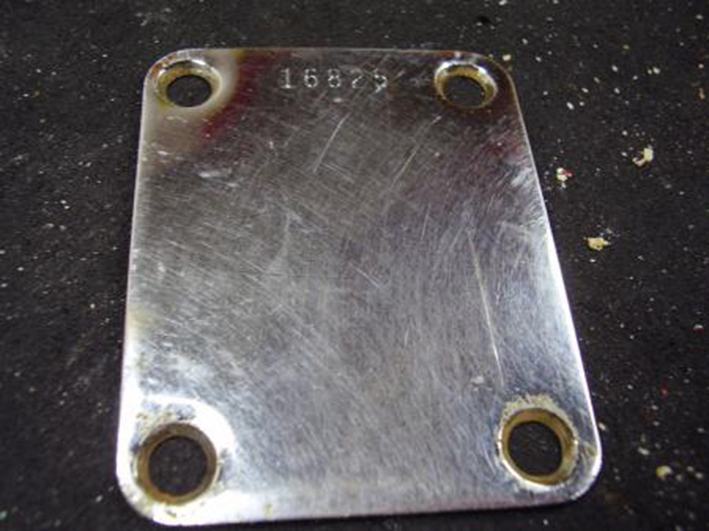 The first of the two pics below is of a 1957 neck plate, which is plain in design and features the serial number only (a 16,000s number which is consistent with the 1957, five-digit number range). 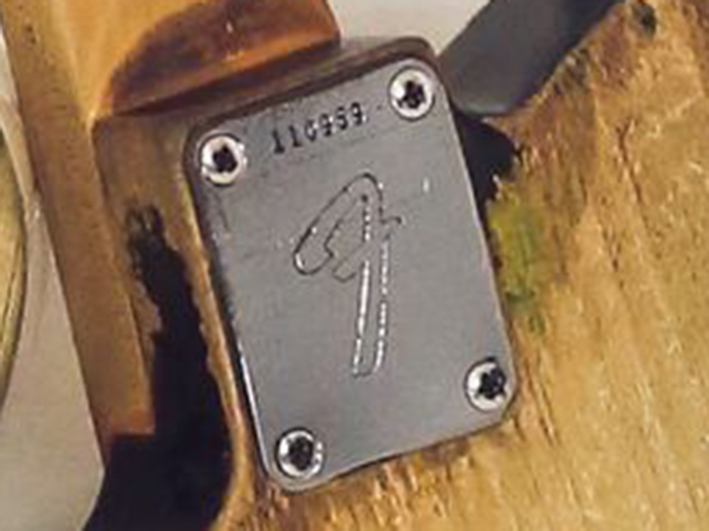 The second pic is of the plate currently fitted to Francis’ guitar which features an ‘F’ stamped into the plate and a six-digit number, both of which are inconsistent with all 1957–59 models. Looking at all of the above we can only conclude that the plate comes from another mid-1960s guitar. 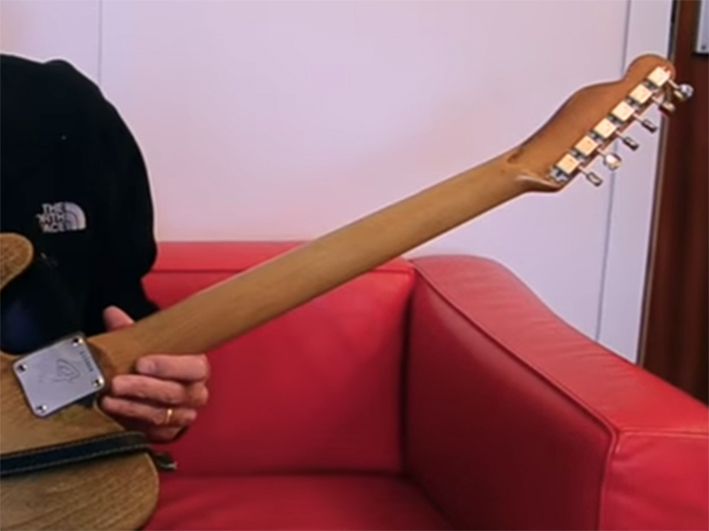 One possibility (although doubtful) may be that the neck plate was transposed from another guitar in the Quo camp. There are a couple of replica guitars with different tunings used by Francis on the tour, as well as a backup replica and maybe a few more besides, but the ‘Down Down’ guitar can be ruled out as it’s 1968 model as far as I know. We will probably never know the answer to where the ‘F’ plate came from, or even when it was fitted, but I’m sure there’s an interesting story behind it. The most important thing to remember is that Francis’ guitar had an ‘F’ plate fitted at the time of Live Aid. You can see how dark the neck appears on Francis’ guitar in the first pic below. 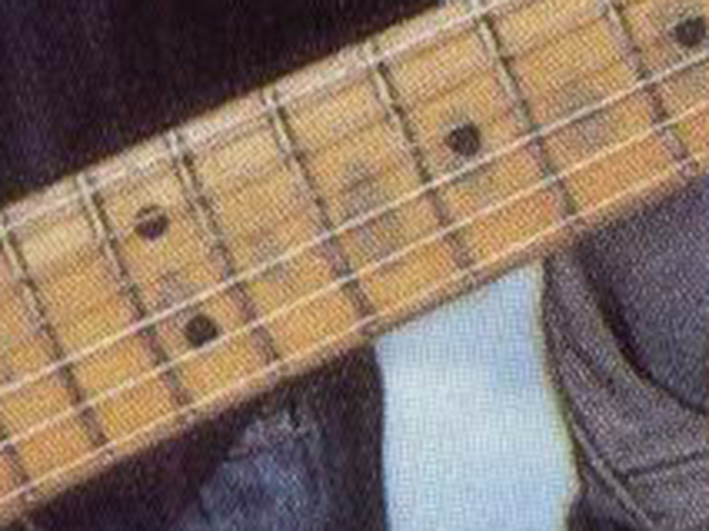 The pic is relatively recent and the neck (and the back of the guitar) are significantly darker now than they were back in 1985–86. It’s highly likely that the neck (like the fretboard) has been refinished several times either with a darker colour or it’s just that successive coats of amber have darkened it, or it may have just darkened with age. If you return to the Rollin’ Home pics or the Live Aid pics, or any of the period videos posted on this blog you will see how much lighter the neck used to be. 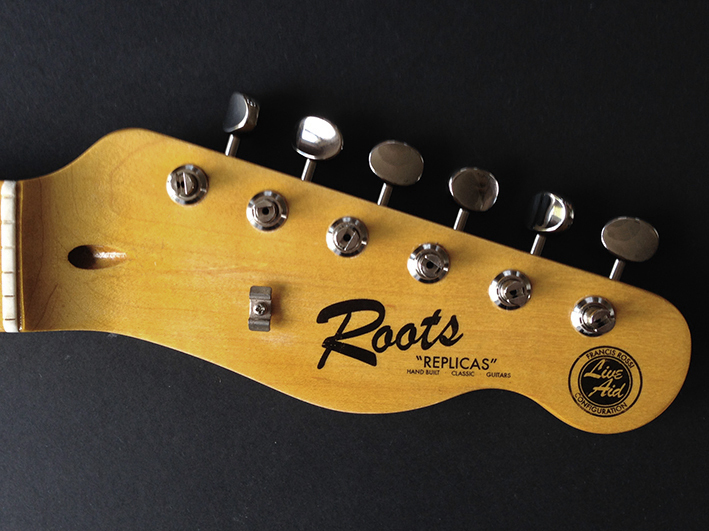 If the neck has been refinished several times, it might explain how the area around the Fender logo looks a lot lighter in colour than the rest of the headstock these days. Now that the neck and body are permanently joined we are able to add a few bits and pieces and the first and most important part to add at this stage is the pickguard. As mentioned in a previous post, the positioning of all body hardware is dependent on proximity to the pickguard, so it should be added as soon as the body and neck are assembled. The pickguard has now been lightly relic-ed and fitted to the assembled guitar using some salvaged pickguard screws from an old guitar. 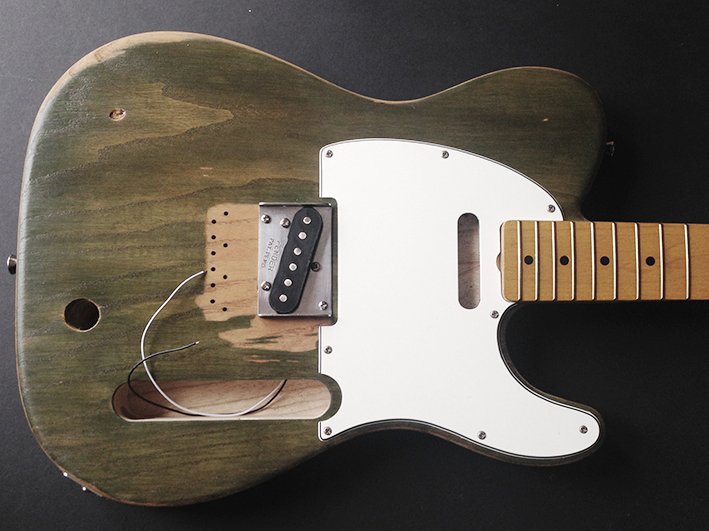 In addition to fitting the pickguard, we have also installed the relic’ed pickup and cut-down bridge plate assembly that we put together previously in the build (see The build begins…). 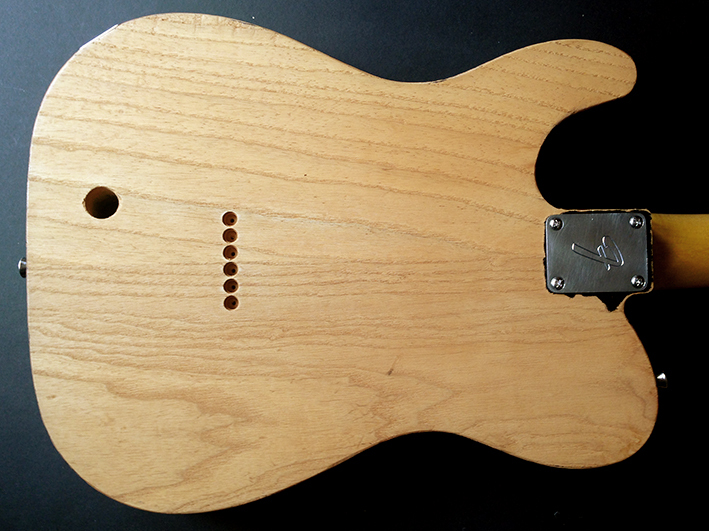 We still need to add the neck pickup and lots more besides, but the build is fianlly starting to resemble a guitar. The second pic above shows the assembled guitar from the back. As mentioned previously our body is a standard 2-piece rather than the 3-piece used on Francis’ guitar. However, the 3-piece look could be replicated quite easily with some careful relic’ing of the body to darken the three areas which make up the sections on the OG. I have decided not to do that on this build as I’d like this guitar back to wear and to get dented and dirty naturally over time. The back of the body on Francis’ guitar is just bare wood, but it has naturally become dirty and shiny (almost looking like a wax finish) over some 50 years of gigging, so when the build is finished (to replicate the look) we will apply a very minimal thin coat of clear wax to afford a little protection against marking. The guitar back will still be essentially bare wood though. A very early Frantic Four clip for you here. This is Quo performing In My Chair from 1971. There are some great close ups of the guitar throughout this video. You will notice that the pickguard fitted on the guitar in this clip appears to have a large cigarette burn, or something similar, on it. This pickguard was around for a while as it features on a few appearances from this period. How can this Rossi guitar be purchased. Are they made to order. How much do they cost. Hi, these guitars are not made to order as they take so long to make and I only make one (or maybe two) a year and then sell them at the end of the process. Sale details and prices will be posted on this blog soon.